Want to earn service hours, eat snacks, and make the library better for teens? 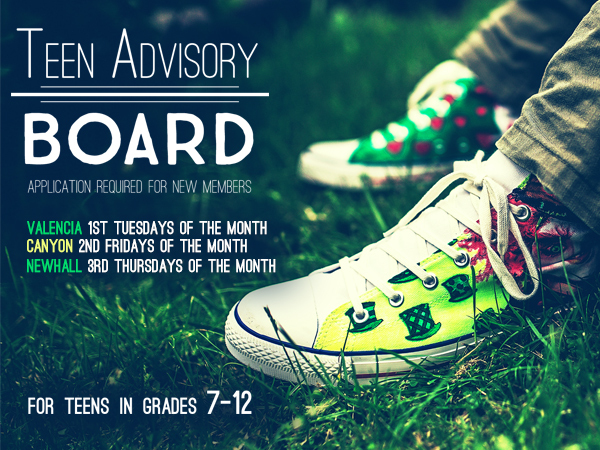 If the answer is YES and you’re between 7th and 12th grade, the Teen Advisory Board (TAB) might just be for you! Valencia: Tuesday, September 5th, 5 – 6 p.m.
Canyon Country: Friday, September 9th, 4:30 – 5:30 p.m.
Old Town Newhall: Thursday, September 15th, 5 – 6 p.m.
We’ll fill you in on why we’re looking for teens like you and what you can expect out of your time with TAB. Help shape teen services – plan programs that matter to you! Gain leadership skills – great for future jobs and college apps! Get your voice heard – tell us what books + movies you want to see! Make new friends and preview teen activities! Intrigued? Know someone else who might be a good fit? Spread the word and come learn more with other teens at the first meeting! More details and link to the full application available here. community service, service hours, Teen Advisory Board, Teen Programs, volunteers. Bookmark.